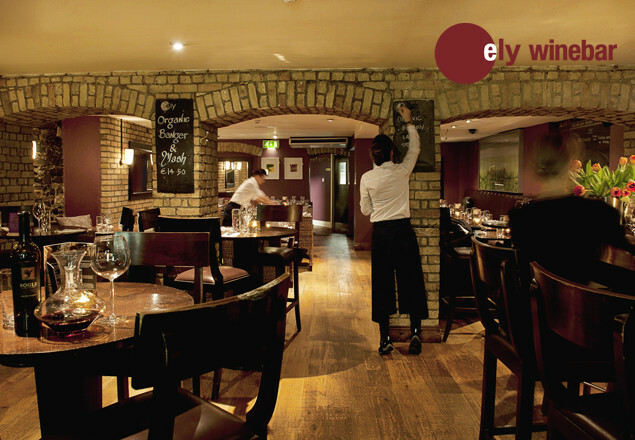 Treat yourself to a 3 course A La Carte dinner for 2 at ely wine bar plus a great bottle of organic wine. With this offer from Rewarding Times, you can enjoy wines from two of the world's greatest wine regions and a three course a la carte dinner for two in Dublin's iconic wine bar, ely winebar in Ely Place, Dublin 2.
ely winebar is synonymous with great wine and food in a relaxed setting and has always had an eye on quality and value. Purveyors of food provenance since 1999, ely has continually sourced their organic beef and pork direct from their family's farm in the Burren, Co. Clare. The organic lamb comes from their neighbours, the McCormacs, who live in the "Parochial" house made famous in the comedy "Father Ted" hence the term Craggy Island Lamb. All their wild game, poultry and seafood has always been fresh and local. Their executive chef Ryan Stringer is from Tyrone, of whom The Bridgestone 100 Best Restaurants in Ireland said "Executive chef Ryan Stringer devises and cooks wonderfully smart, clean food, with ingredients that are sourced as carefully as they source their benchmark wines". ely has sourced wines from two of the greatest wine regions in the world, Bordeaux and Burgundy, to complement dishes such as their 28 day dry-aged organic Burren beef fillet or Irish King Scallops. Enjoy the 2010 Chateau Jean Faux from Sainte Radegonde in Bordeaux or the Domaine Defaix Chablis V.V. 2011 from Burgundy. With a history going back to the reign of Louis XIV Chateau Jean Faux was first renovated in the 17th century and again by the current inhabitants Chrystel and Pascal Collotte in 2003. Just outside the appellation limits of Castillon in the village of Sainte Radegonde (which is situated on the southern banks of the Dordogne river facing Saint Emilion), this property is located on fairly steep slopes dominated by pine trees, which create a micro-climate. At the bottom of the slope is a small river that also has a tempering effect. The soils and terroir are exceptional and are planted with 80% Merlot and 20% Cabernet Franc. Château Jean Faux has been organic since 2009 with the 2010 being their best wine to date. The wine exhibits rich mineral, berry and blackberry characters with dark tobacco and a full and silky finish. It's rich and plummy with a hint of aromatic spice, beautifully smooth and long and is a great introduction to what many consider to be the vintage of the decade. Bernard Defaix and his family are fourth and fifth generation vine-growers and their vineyards in Chablis also achieved organic certification in 2009. This Vieille Vignes (old vine) Chablis comes from a plot of 1 hectare of 45 year old chardonnay vines which are perfectly exposed to the ripening sun. Only 25% of the wine is fermented and aged in oak barrels with the remaining 75% going into stainless steel, both for 10 months. The Chablis ‘Vieille Vignes’ 2011 is a superb example of traditional Chablis – precise, mineral and gently citrusy, with the old vines giving more concentrated flavours. These classic Chablis characteristics of lemon, green apple and pronounced minerality are backed up by the slightest touch of oak, expertly used to give the wines a softer, more rounded mouthfeel. It has a depth of flavour not found in many Chablis. This offer allows you the freedom to choose from ely wine bar's full a la carte seasonal dinner menu and, as an added bonus, you can also enjoy both wines by the glass if you prefer. The choice is yours. Perfect! Click here to see ely winebar’s menu. Vouchers are valid from May 5th until August 3rd 2013. Voucher valid only at ely winebar 22 Ely Place. Vouchers are valid Monday – Saturday after 7pm (restaurant is closed on Sunday). 3 course dinner includes choice of starters, mains and desserts plus a bottle of wine.